So it is a part of KAVG. It is the amount of time an I/O spends waiting in the queue (if there is queuing) and KAVG adds any additional latency in the case of CPU contention, or if something is causing ESXi to hold the I/O in the kernel. This is why KAVG and QAVG is essentially always equal. If you hit the queue depth limit and latency is induced due to that, the latency is recorded in QAVG and also in KAVG. But KAVG and QAVG always seem to be the same number. So what is the value in one or the other? QAVG is a subset of KAVG. Like shown in this image that is plastered all over the internet. First a customer had really slow Storage vMotions from an old array to their FlashArray. Looking at esxtop, KAVG and QAVG were crazy high. Turned out to be a bad cable which was causing all kinds of aborts. I was testing array-based throughput limits on a volume. This also caused crazy high KAVG and QAVG (which is of course would be expected). But the weird thing was that in both scenarios QAVG was HIGHER than KAVG. How is that possible? As you can see in the below screenshot, QAVG is 25 ms while KAVG is 18 ms. So how could something that is a subset of something else be larger than the parent? That’s some bad math. The documentation everywhere was wrong. Maybe a mix of the three? I really didn’t think it was the first option. Too consistent and too different. The second option also seemed unlikely, but maybe the current documentation wasn’t really wrong, but more of an oversimplification? Number 3 seemed the most likely. So I reached out to VMware on this one. Thanks to Mark and Jason, for setting up this call. I explained my situation and they agreed I was not crazy (well concerning this) and something indeed seemed wrong. After some more discussion, this was the scoop. The answer is a bit of all three of the above options. The first thing to understand is that GAVG is measured. DAVG is measured. QAVG and KAVG are actually calculated. (KAVG = GAVG – DAVG for instance). But that is not the cause of the issue really. The thing to understand about KAVG, DAVG, and GAVG is that they only measure VM I/O activity. They do not measure all I/O. There is a variety of hypervisor I/O that occurs as well. Hypervisor I/O is low priority. Guest (VM) I/O is high priority. Therefore in times of contention, hypervisor I/O gets pushed out of the way. Big time. 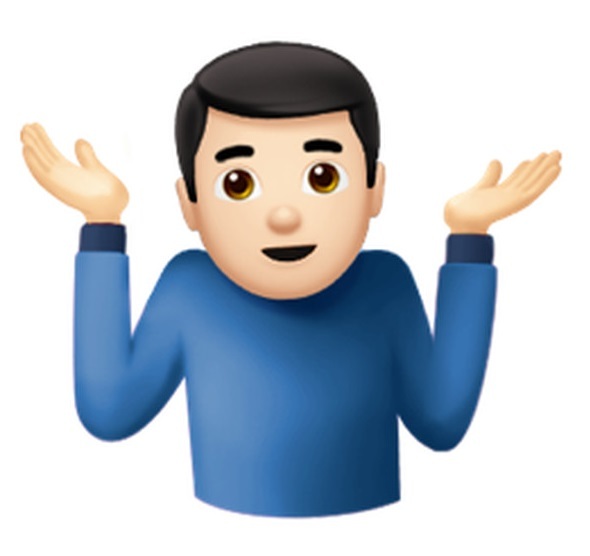 So if there is a bad cable, causing aborts and I/Os to be stuck in the queue to retry, etc. Or if the array is throttling. This non-VM I/O will be punished in favor of serving your VMs. So back to QAVG. Why is it higher if it is indeed a subset of KAVG? Well it is because what esxtop reports under those metrics are not calculated from the same set of data. 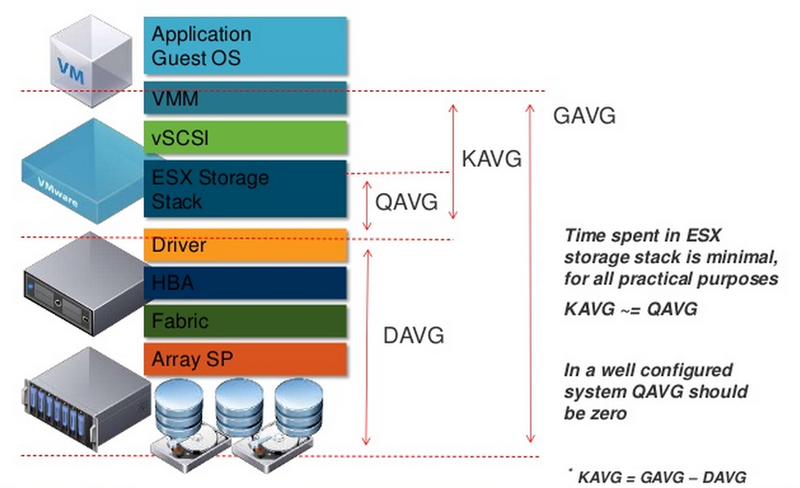 KAVG is calculated from VM I/O only. QAVG is actually all I/O in the queue–including hypervisor metadata changes and other operations. So the average for KAVG is lower. Since the hypervisor I/O is throttled so much more, its average latency is much higher. So this throws off the average and makes QAVG much higher than KAVG. So it is not wrong, QAVG is a subset of KAVG. But since these are calculated values, not measured ones, and use different data sets to calculate themselves, they do not appear to line up with this logic. We can prove this out. In esxtop, the reported average latency is 19 ms. The QAVG is 25 ms. In my VM, the average latency is 19 ms.
Not 25 ms as reported in QAVG. So the guest is not experiencing the higher latency. Well, a few things. It is actually fairly helpful. If you see QAVG and KAVG are non-zero and equal. You likely have hit your queue depth limit, or for some reason ESXi itself is throttling the queue. Look at my video above or the earlier blog post. If you see QAVG and KAVG are non-zero but unequal (QAVG is higher) you either have a SAN issue, or the array is overwhelmed or QoS throttling. I will be digging a bit deeper into this, I will be sure to report more if I found out more. very very informative. Thanks Cody..! 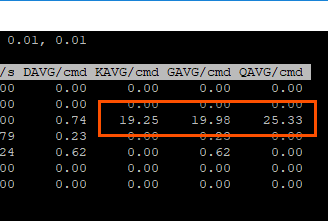 If Vm HDD has IOPS limit and rests on it should grow KAVG ? Yes–you will see KAVG grow when IOPS limits in vSphere are engaged. Thank you very much, Cody! What if we see QAVG and KAVG are non-zero but unequal but KAVG is higher? Are we hitting our queue depth limit but also seeing some other issue? Hmm interesting. They can be a little different, but if KAVG is higher it is usually only by a little unless there is some kind of contention in the kernel. If your %USD is not 100 though that means you have not filled your queue–so I would check that. Also, there is a bug in KAVG reporting that was fixed in 6.7 U1–it is possible it could be related to that. 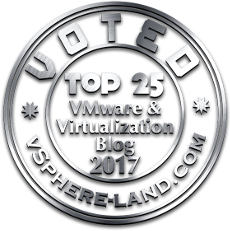 Really useful, especially when read alongside your ESXi queue article from feb 2017. Not directly related to the KAVG/QAVG metrics, but do you have any idea what it means when the ACTV counter is higher than the DQLN? This is from a Datastore with conflicting workloads (DQLN reduces to 32 from 128) and with ACTV = DQLN and QUED >1. But it’s the regular entries where the ACTIVE Commands counter is higher than the Device Queue Depth that puzzles me (so we see %USD at over 100). Hmm depends on how long it exceeds it. If it is just a short period, it might just have to do with DQLN jumping up and down. Which can cause the ACTV to be a bit above what the DQLN is set to under it clears out. Could also be a sampling issue around the counters. If it is a long period of time, then I am not sure. Might be worth a VMware support case.